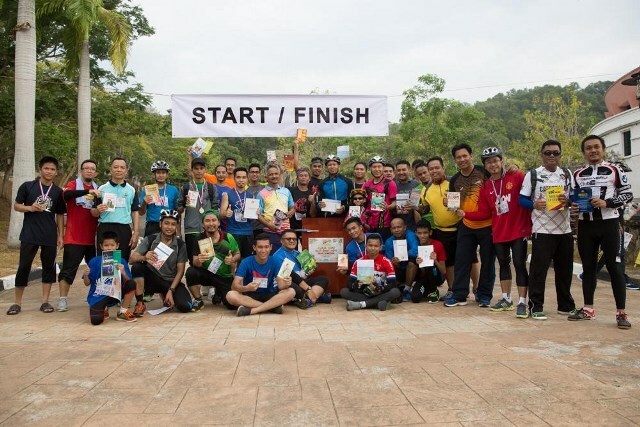 MONDAY, 28 MARCH – The Charity Book Run and Ride programme organised around Universiti Malaysia Sabah (UMS) campus on Saturday received encouraging response with more than 150 entries. This activity which was jointly organised by UMS Library, Bursar Department, the Development and Maintenance Department (JPP), Department of Information Technology and Communication (JTMK) and the Librarians Association of Malaysia Sabah Chapter witnessed participants ran a distance of 7 kilometres and 12 kilometres of cycling. Librarian, Mohd Adam Sabri Magi from UMS Library representing the organisers said the programme among others hoped to foster the spirit of camaraderie among UMS community and the surrounding public whilst instilling the culture of healthy living through recreational activities and inculcate the desire to share knowledge through book donations. “The programme which is based on sports saw participants contributing at least two books each that were either academic or novel, placed at UMS Library and would be donated to schools and institutions around Kota Kinabalu,” he said when met by UMS Media representative. Adam added that the first 20 participants who managed to finish the race would win medals and certificates. The flagging off was officiated by UMS Registrar, No’man Hj. Ahmad at Dewan Canselor (Chancellor Hall) premises.